Pork rinds. Cracklins. Grattons. Chicharrones. 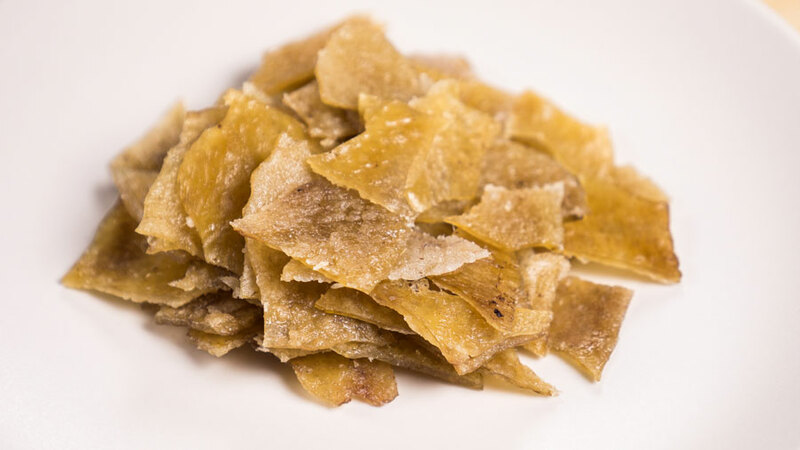 Whatever the name, each is synonymous with crispy, crunchy, fried pig skin. 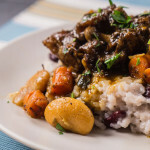 While there may be slight variances between each, they all have a rich and regional culinary history. I like to use every bit of an animal when I can. Bones for stock, bits of extra fat for sausage, and, when it comes to extra pig skin, chicharrones. 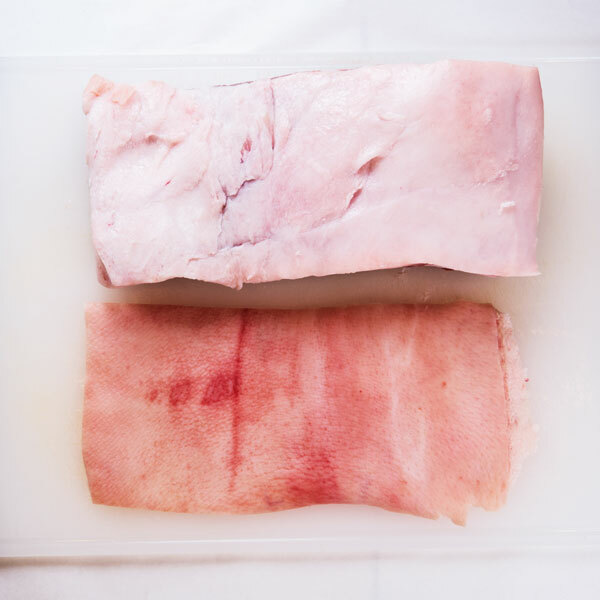 In the homemade bacon tutorial I trimmed a large piece of skin off the back of the slab of pork belly and saved it. 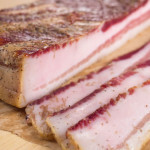 I save all of the skin when I make bacon just so I can make this recipe. If you happened to save yours, now is the time to pull it out of the freezer. 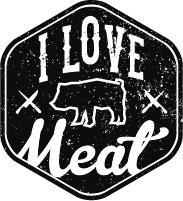 If you didn’t save the skin, or you haven’t had a chance to make bacon yet, a trip to your local butcher is in order. They should be able to source some skin for you. Personally I would just buy a belly; it comes with a free piece of skin! 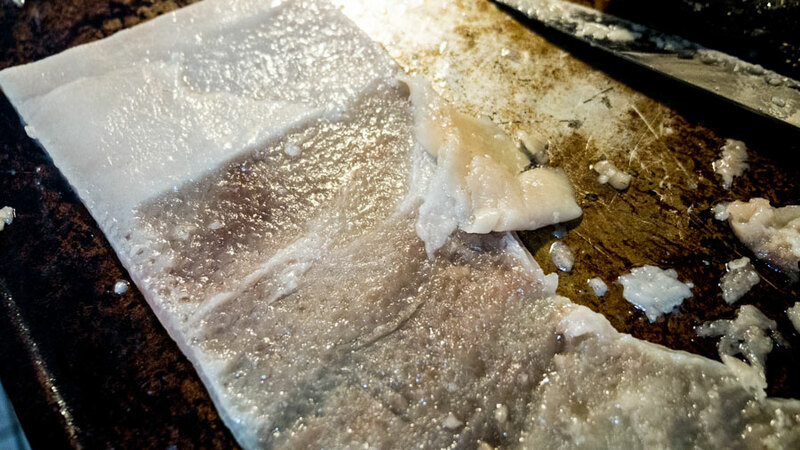 You can take these bits of skin, cut them up, and fry them right now. They would make a tasty treat with minimal fuss. However, the texture would be very dense and possibly chewy, and the fat will make them pretty greasy. You’ll want a light and fluffy crunch similar to a cheese puff instead. It will require some extra work, but trust me – it’s worth it. There are two enemies to conquer in order to reach maximum fluffiness. They are fat and moisture. You will need to get every last bit of fat off the skin and then dry it out as much as humanly possible. Lets start by getting rid of the fat. 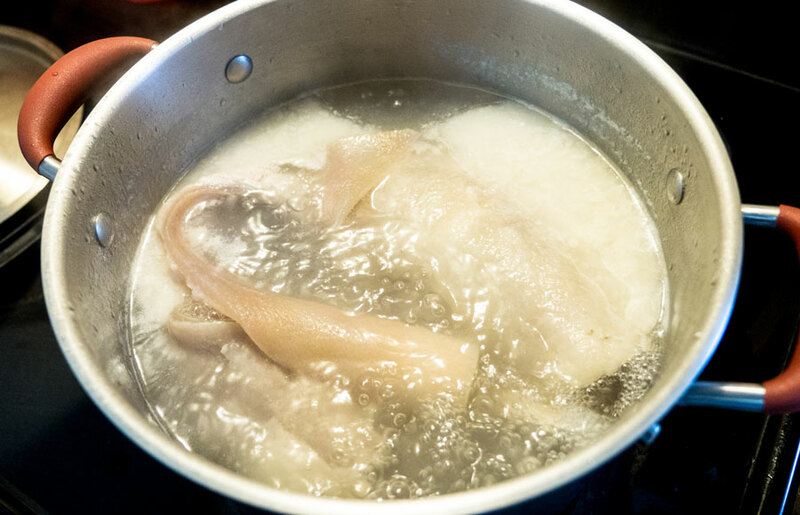 Fill a large stockpot with water and drop the skin in. Bring it to a boil for at least an hour and a half. Be careful with water levels when you fill the pot, as you don’t want it to run over when boiling. After you’ve boiled the skin, take it out of the water and place it on a rimmed baking sheet. The skin will be very soft and will tear very easily when taking it out. It’s not the end of the world if it rips, but try your best to keep it whole as it makes it easier to scrape the remaining fat off. Before scraping though, it needs to cool it down in the fridge overnight. If you tried to scrape the fat off now you would only succeed in tearing the skin to sheds. It is simply too delicate when warm and fresh out of the pot. 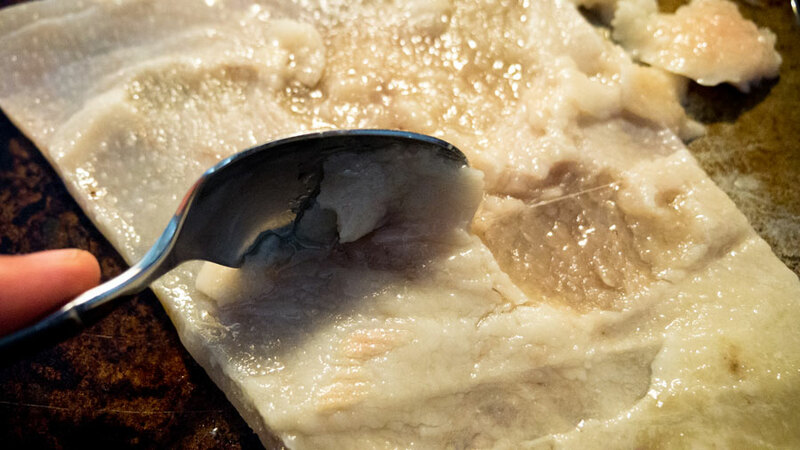 After the skin has had a chance to cool, grab a spoon and start scraping the fat off the back of the skin. You need to get every last bit of fat off or the texture will come out chewy. If there are stubborn pieces that wont release the fat, cut them out and toss them in the garbage. They will not fry up correctly. The first enemy has now been vanquished. The fat is successfully eliminated. Now it’s time to tackle that moisture problem. 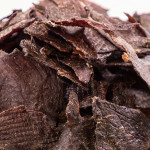 Place your fatless skins in a dehydrator at 160 degrees for 12 hours. They should come out looking like a piece of shiny brown plastic. If you don’t have a dehydrator you can try placing them in an oven overnight at 160, but a dehydrator is ideal. I personally use an Excalibur Food Dehydrator I find it’s combination of temperature controls, capacity, and front loading design to be a game changer. After you’ve made your pork plastic, you need to break it up into small pieces. If you dropped the whole piece of skin into hot oil, it would expand like a giant sea monster and over take the pot. Because it expands so much, you’ll need to break up the skin into bottle cap sized pieces. Much bigger than that and they get unruly after they are fried and are harder to eat. After you have a nice pile of broken pieces it’s time to get the oil ready to fry. These pieces need to fry at a very high temperature (400 degrees) to ensure their crispiness. Make sure whatever oil you are using has a smoke point at least that high. Butter, lard, and vegetable shortening all have a smoke point lower than 400 so they will burn if you try and heat them up to those temperatures. I like to use canola or peanut oil. If you can get it, grape seed or safflower oil work even better. After the oil is up to 400 it’s time to fry. Be sure and have some tongs or a wire skimmer handy as these only take 15-20 seconds to puff up in the oil. You don’t want to drop them in and then go searching for a tool to fish them out. They will overcook before you get back to them. When they have stopped expanding it’s time to take them out. Don’t drop too many pieces in the pot at once as they have a tendency to stick together. 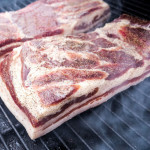 Ok, last step: It’s time to season up these pork pillows and give them a new layer of flavor – Grippos BBQ seasoning. 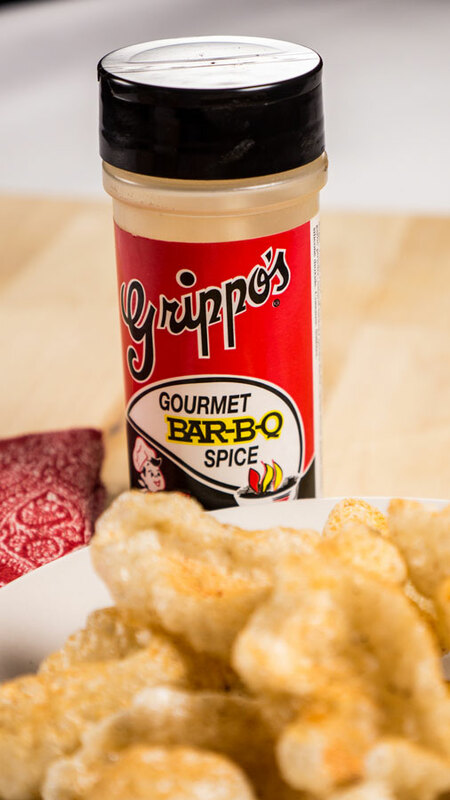 While attending college in Cincinnati Ohio I was introduced to Grippos BBQ potato chips and fell in love with them. Spicy and sweet, my friends and I consumed them by the box. Yes, I said box, one and a half pounds to be exact. To this day, one bite instantly takes me back to those great times. When I discovered that Grippos had started to sell the bbq seasoning from their chips in my local grocery store, I grabbed a bottle and started to sprinkle it on everything. From popcorn to baked potatoes to french fries and everything in between. However, the real revelation came one day after making a fresh batch of chicharrones. I reached in the cabinet for the salt and pepper and the bottle of Grippos BBQ seasoning was front and center. Light bulb. 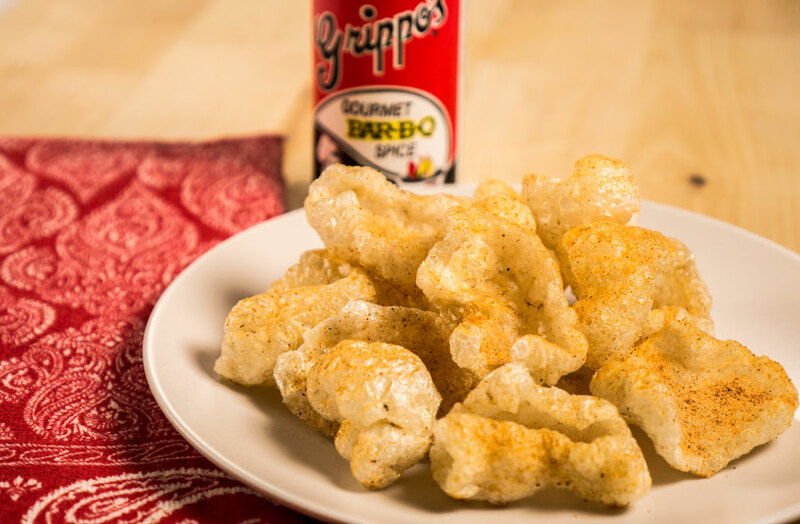 Fresh crispy pork skins and Grippos seasoning are a match made in heaven. It’s now the only thing I ever put on them. If you don’t have any Grippos seasoning, don’t fret. Chicharrones are excellent with whatever seasoning you have at hand. 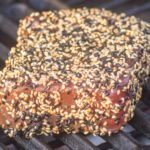 Salt and pepper, classic bbq rub, Chinese five-spice, Lawry’s Seasoned Salt; the flavor possibilities are endless. Sprinkle whatever seasoning you decide to use on your hot chicharrones and serve immediately. I find it best to only fry up what you want to eat that day. After a day or so they will really start to lose their crunch and will start to get a packing peanut texture. I prefer to de-hydrate skin in big batches and keep the pieces vacuum-sealed until it’s time to fry. Making these smaller batches lets you enjoy your chicharrones at their peak freshness. Thanks for posting this – you nailed it. I went looking for a recipe that would reproduce the pork rinds served at La Bête in Seattle and this is it! Some lead time required, but the results are totally worth it. They’re bloody addictive! 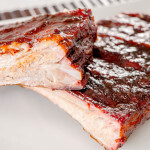 I definitely learned not to let them overcook – even a slight amount of browning makes them tough. Your blog is great. Next stop for me: bacon! I am a University of Cincinnati graduate and a born and raised Ohioan myself. So anything with Grippos is right up my alley. 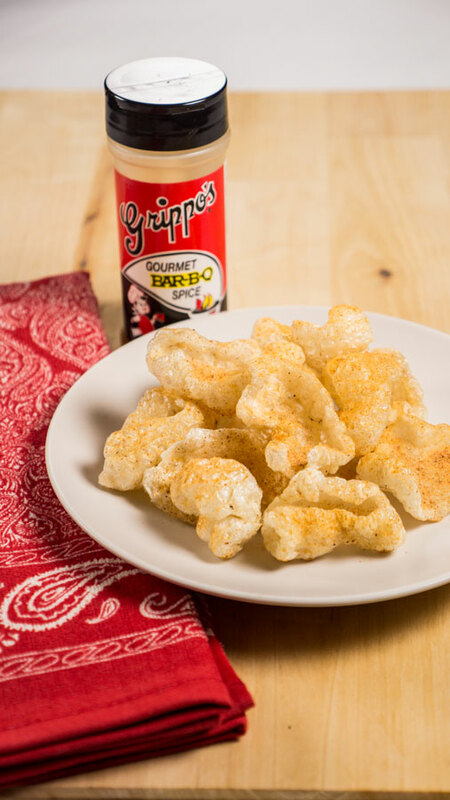 I am not a huge fan of pork rinds but I am impressed that you know how to make them! Nicole, I’m a Xavier grad so try not to hold that against me. 🙂 Thanks for the kind words. when I lived in Lafayette I’d buy bags of these tiny hard squares in the grocery store. dropping them in hot oil made them explode. they were great. do you know where I can buy these pork plastic squares? 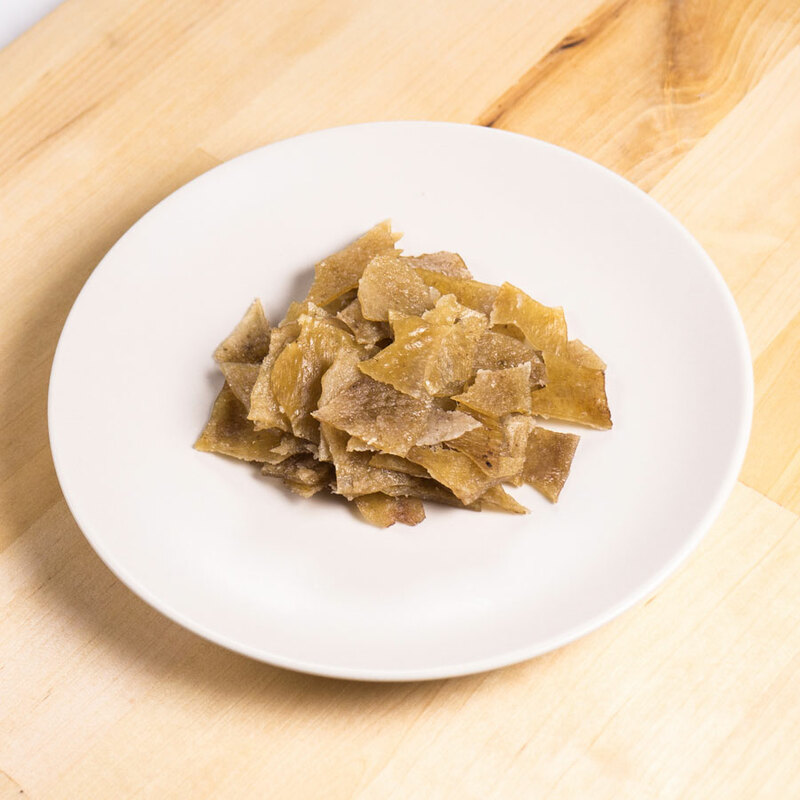 Cueritos are the same as pork rinds but are soft and chewy, as they are not heavily cooked unlike the chicharron, which is very crispy and often overcooked. 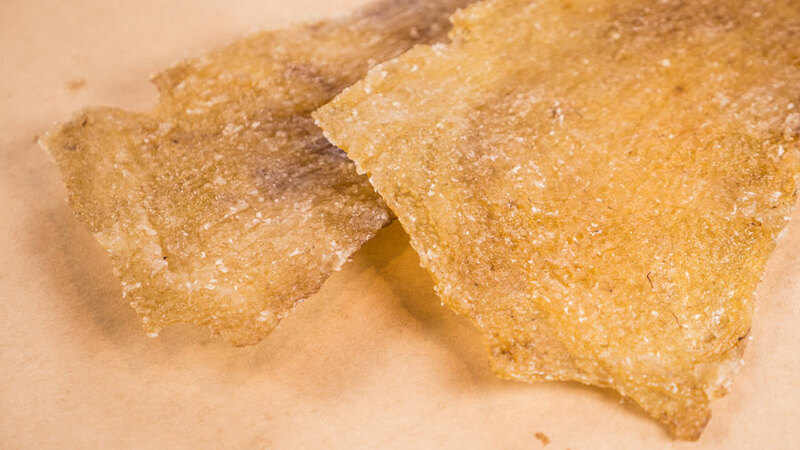 What is the best way to store the dehydrated skins? Can they be frozen? Humidity is your enemy with the skins. They will get chewy pretty quickly. Vacuum seal would probably be your best bet. I believe that avoiding refined foods would be the first step to lose weight. They will often taste very good, but packaged foods include very little nutritional value, making you take more only to have enough energy to get throughout the day. For anyone who is constantly taking in these foods, switching to whole grains and other complex carbohydrates will help you to have more energy while ingesting less. Great blog post.